British Triathlete, Chrissie Wellington has thanked MP Julian Huppert for helping to put women’s cycling “firmly on the national and global agenda” after it was announced there will be a women’s race in the Tour de France. Chrissie, one of the founders of the Le Tour Entier pressure group which has been behind the campaign for the women’s race, said Julian had given “unwavering support”. 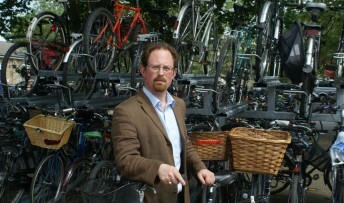 After meeting Chrissie last year, Julian, co-chair of the All Party Parliamentary Group on Cycling wrote to the Women’s Commission at the Union Cycliste Internationale in Switzerland, asking about its plans to tackle the under-representation of women in competitive cycling. He told President Tracey Gaudry: “It is clearly vital that the under-representation of women in competitive cycling and lack of support compared to that given to men’s cycling is given the focused attention that I hope the Women’s Commission will bring. The women’s Tour de France will be staged as a one-day event on France’s Champs-Elysees to accompany the final stage of the tour. It will be the first time since 1989 that women cyclists have raced alongside men in the event. Julian said: “I am delighted that this campaign to promote women’s cycling will see them compete in the world’s most prestigious cycling race. “The women’s road race at the London Olympics showcased how impressive sportswomen can be and proved a real inspiration. I am confident the women’s Tour de France will do the same showing the world the talent that is out there and inspiring other women to take up cycling.